What is the next industry Apple can disrupt? Banking! While anticipation grows for a possible Apple (s aapl) television launch at some point, the company may want to think about diversifying into banking. A new survey of 5,092 respondents in the U.K. and the U.S. from marketing and research consultancy KAE found that one in 10 people would consider banking with Apple, and 43 percent of existing Apple users would. Apple becoming a bank is a pretty off-the-wall idea and not likely to become reality any time soon. But the study demonstrates the kind of trust that Apple has built up with its brand. Two-thirds (66 percent) of respondents cited “trust” as their primary reason to consider Apple for banking, and a little over half believed Apple could making banking with them easy to access and manage and reliable. KAE said that Apple would face no capital constraints in building a deposits base, even with its recent dividend and share buyback plan. And with its history of successfully cross-selling products, its potent retail locations and affluent customer base, Apple would be well positioned to become one of the most profitable consumer banks, KAE said. Lee Powney, chief commercial officer at KAE, said it would be very unlike Apple to delve into banking, but the temptation could be hard to resist. Apple would only move in, said Powney, if it changed the existing rules of competition. 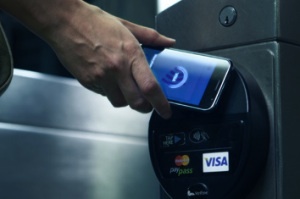 Maybe not banking, but how about mobile payments? Again, Apple, is very disciplined about what areas it moves into and is famous for saying “no” to all kinds of projects. But the numbers indicate an openness from the public for Apple to get into more financial services. Apple may not want to get into banking, which would carry a lot of regulatory burdens, but it could take that trust and build a mobile payments service, something we’ve speculated about. Apple’s brand is very much tied to computing and services built around that. But increasingly, the bigger game in mobile is turning to payments, which could be worth $670 billion by 2015. That’s a market that everyone from the carriers, banks, credit card companies and a host of start-ups would like to own. Apple already has a strong financial relationship with its consumers via iTunes, which is believed to have more credit cards on file than any other company. Apple has already applied for patents that could lead to an end-to-end system that would include mobile marketing, mobile payments and mobile retailing. Apple also has a pretty smart customer base that may be open to some kind of financial play. KAE found that 81 percent of respondents open to banking with Apple are technology savvy and are already banking online. The survey found that 62 percent of these consumers already show great interest in using their smartphone for personal banking and 53 percent believe call centers will be replaced by online service centers. I would be very surprised to see Apple make the leap into banking, though mobile payments is not a stretch. Consumers are already able to pay with their iTunes account for smaller items at Apple Stores using an App Store app. But whatever happens, it shows that Apple has a lot of options when it builds upon a foundation of trust, innovation and ease of use. I would use IMPROVE instead of DISRUPT. They could disrupt any number of industries. With $100b Apple could start making baseball bats or electric cars or refrigerators or boats or lawnmowers or Mars rovers. They could buy Twitter or IBM or Facebook or Caterpillar or IKEA or Ryobi or Lego or Greece. If you ask people if they’d buy furniture made by Apple. Why not? This speculation is pointless and a sure sign that there are too many tech journalists sitting in their cubicles with nothing to write about. If you’re in everything, you’re in nothing. IBM probably knows this better than anyone and I believe that Apple might have seen that. Better to be in mobile related services than banking. Starting a financial services is one of the dumbest strategy that would be done by Apple. As soon as saw the credit card reader by PayPal, I understood that mobile and banking are now integrating seamlessly. It’ll be interesting to see what mobile manufacturers incorporate in their design and hardware to fulfill these needs. Talk about the easiest way to fall from grace with the public. People love to hate their bank. Considering their transaction fees for the app store, I’d be a bit put off by paying them 30% of my ATM withdrawals. Apple also hired Benjamin Vigier, in August 2010, he created the first NFC wallets and Starbucks Card Mobile. I have little doubt that Benjamin’s abundant expertise is left toiling on projects that do not include Payments and NFC. There are other things that point to a certainty that Apple will at the very least facilitate Payments through an iOS device. I think Apple has no desire issuing Payment Card like products or processing Payment Cards. This would mean they would connect Visa and MasterCard to Merchants and Consumers and earn income from this arrangement. In light of PayPal’s expansion in to Retail Payment Card processing and Square’s astounding success, Apple’s entry will completely challenge both. In my view it is not a matter of if Apple will do this, it is a matter of when. Certainly DoCoMo bought a bank to provide services. The question would be, what new services could be developed to make such a bank attractive? And, do people bank based on those services? Apple would certainly be missing out on a huge opportunity to ignore this idea, but I guess Apple already has its hands full selling every device it can possibly make. I’d love to see Apple acquire some non-hardware business and banking is about as good as it gets with Apple’s already huge customer base. It might not be as large as Amazon’s, though.